What's Schipper Saying? 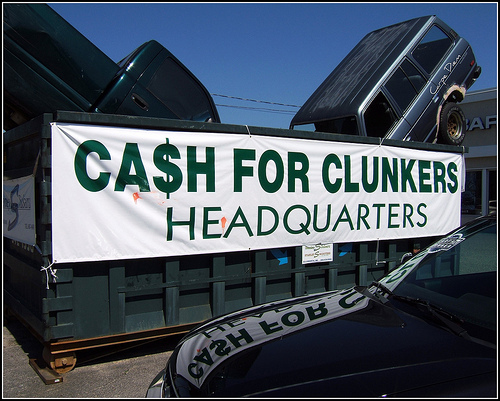 "Very Little Energy Savings Per Car Clunked"
Cash for Clunkers "headquarters" in Maine. Photo by Tony the Misfit. Welcome to our first weekly installment of “What’s Schipper Saying?”, a “Where’s Waldo”-esque online scavenger hunt of comments about sustainable transport, cities and fuel efficiency made by EMBARQ Founder Lee Schipper, a senior research engineer at the Precourt Energy Efficiency Center of Stanford University. Schipper, a.k.a. Mr. Meter, leaves a trail of commentary on popular blogs across cyberspace. We track him down…so you don’t have to…and offer a round-up of his latest responses to hot topics in the world of sustainable cities. This week, he had something to say about Cash for Clunkers. We did not address the issue of whether C4C led to more car sales than otherwise. Again, a detailed macro economic model is required. A month ago C4C was hailed as stimulating spending in July and August. Today it is cursed as having ended, resulting in weaker auto sales. But C4C only paid for a small part of the price of a new car. If more consumers bought cars because of C4C than otherwise, what did they NOT buy in order to scrape together money to buy more cars than otherwise. The answers are not simple, but all evidence points to a very small energy and CO2 savings. And my bet is once we have monthly figures on consumer expenditures and car sales for the entire period we will see little benefit from C4C. Ironically the roughly $3 billion doled out would cover the extra cost of roughly 600 -700 THOUSAND hybrid cars compared with conventional cars. Now there would have been real savings. Dear Lee, It's Been a Wild Ride!